KEY CONCEPT: Concept of time. DESCRIPTION FROM THE PUBLISHER: What can happen in just a second, a minute, or an hour? How can we measure time? The flap of a vulture’s wing. A crocodile’s heartbeat. The weight of a baby blue whale. The life of a mayfly. These increments of time may sound a bit strange, but they are all fascinating ways in which we can think about time. But what exactly is time? 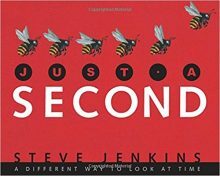 In Just a Second, the award-winning author-illustrator Steve Jenkins brings forth unique ways to think about time beyond the hands we see every day on a ticking clock.